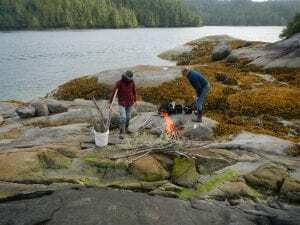 During our recent investigations in the Broughton Archipelago, John Harper, Mary Morris, John Steele and I saw great quantities of barnacles growing on the bedrock adjacent to the clam gardens in the upper intertidal zone. The thatched barnacle (Semibalanus cariosus) is the most impressive because it can reach a relatively large size (6 cm diameter base). I have written about this barnacle species before because they were so abundant in a portion of the deposit at Kit’n’Kaboodle, Dall Island, southeast Alaska (Moss and Erlandson 2010). Although we did not conduct any excavation, I was surprised to see how common this species was in the eroding deposits of Kwakwaka’wakw villages, where we also observed burnt barnacle tests. Franz Boas and George Hunt (1921) described ways the Kwakwaka’wakw collected and cooked barnacles and Haida, Moachat & Manhousat (Nuu-chah-nulth), and Coast Salish also collected and cooked barnacles (Moss and Erlandson 2010:3367-68). I wanted to try to cook barnacles and John, Mary, and John were all “on board,” although Mary (quite rightly) insisted we not eat them. 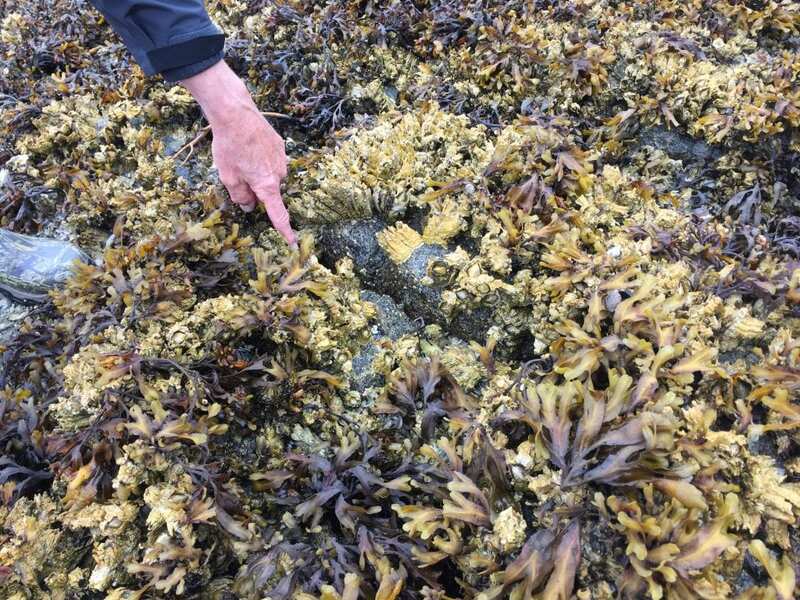 Although barnacles don’t appear to be susceptible to PSP (paralytic shellfish poisoning), we don’t know enough about their safety, especially during the summer in these times of climate change. But I will reveal that three of us tasted barnacles and they are delicious! They tasted just like crab, and I had a hard time not swallowing. Collecting barnacles is not easy everywhere. 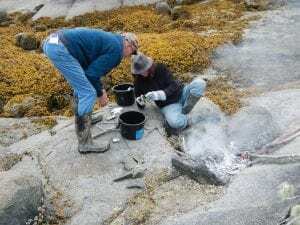 They adhere tightly to the rocks, and even with a pry or scraper, you leave the meat behind because Semibalanus lacks a basal plate and is attached just along the circumference of its test by a layer of cement (Harris 1990:45). This species is hard to dislodge. The easiest way to collect Semibalanus barnacles is to find a place where they are abundant, growing atop each other. Then the barnacles can be knocked off with one’s booted foot (which was my technique). We cooked the barnacles two ways. First, I steamed them in a regular vegetable steamer in the galley of the M/V Golden Dawn. I used some dental tools to pick out the meat, the same ones I use when serving Dungeness crab. The second technique is more traditional and was inspired by Boas’ and Hunt’s descriptions. 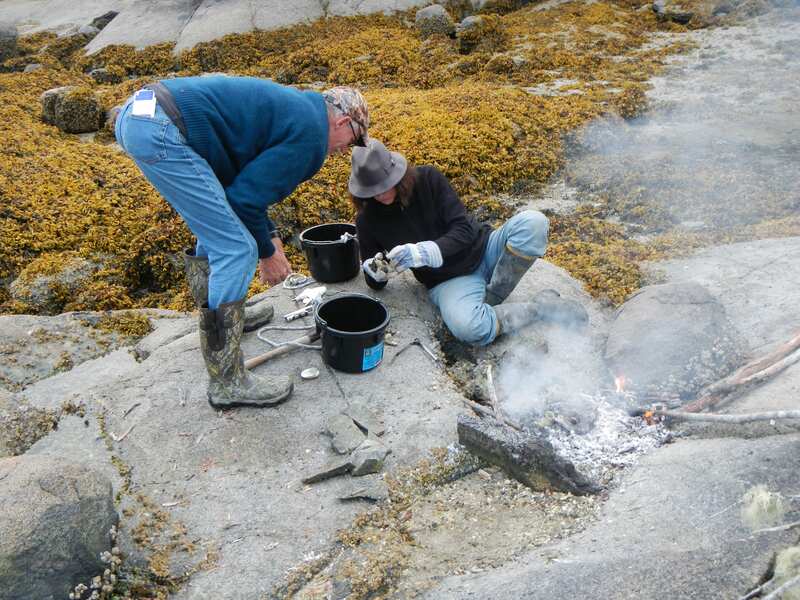 We built a fire in a small depression in bedrock in the upper mid-intertidal. We used dead cedar limbs that John and John had gathered from one of the many cedars collapsing into the intertidal zone (due to rising sea levels?). The fire burned hot; some barnacles were placed on a hot rock in the middle of the hearth, while others were nestled among the hot coals. It is hard to tell when barnacles are fully cooked– I was looking for the meat to harden up and become opaque as crab meat does. After about 30 minutes, the tests were clearly burning, although I wasn’t sure the meat was done. 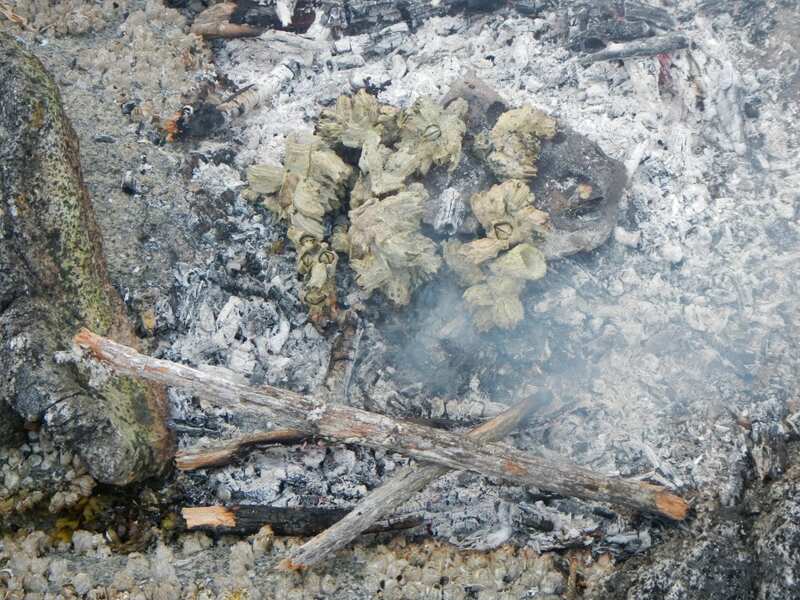 Cooking in a fire this way may have been too hot; Kwakwaka’wakw recipes generally employ steaming, which I infer had lower heat and prevented burning. 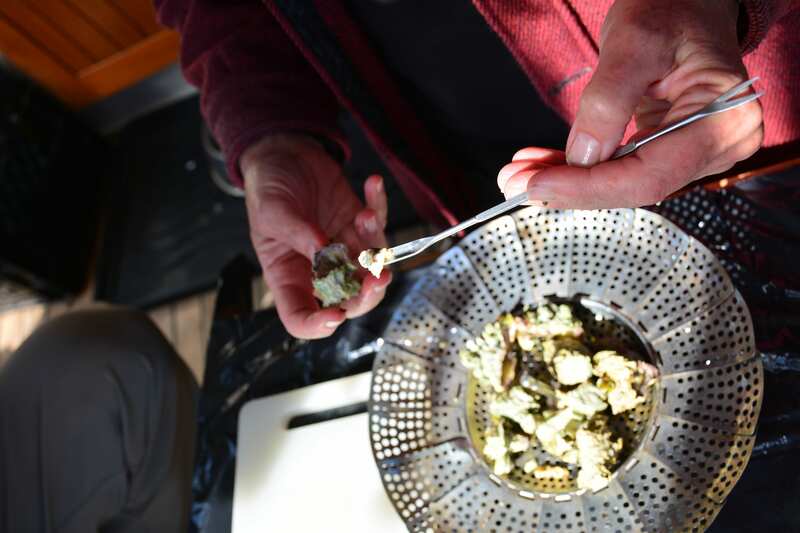 Some of our roasted barnacles were edible, but some were burnt. 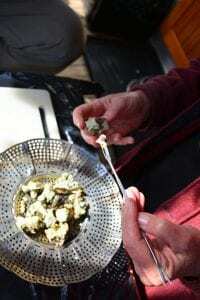 As mentioned above, because we weren’t eating them we didn’t cook that many, but I wanted to share this experimental archaeology because we found it informative. 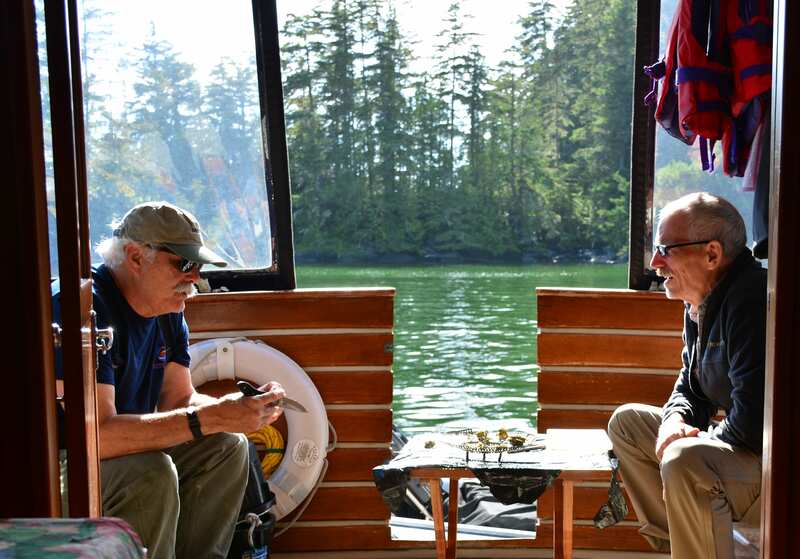 Many thanks to my three compatriots… John Harper and Mary Morris who made this trip possible and who were “game” for this experiment, and to John Steele whose fire building skills have been employed before. Boas, Franz 1921 Ethnology of the Kwakiutl. Bureau of American Ethnology Annual Report 35, Parts I and II. GPO, Washington, D.C.
Harris, Vernon A. 1990 Sessile Animals of the Sea Shore. Chapman and Hall, London. Moss, Madonna L. and Jon M. Erlandson 2010 Diversity in North Pacific Shellfish Assemblages: the Barnacles of Kit’n’Kaboodle Cave, Alaska. Journal of Archaeological Science 37:3359-3369. That was so interesting. Especially liked seeing the four of you together and the marvelous photos.